‘Sulsaemit’ Bonhyang Shrine, the seat of the goddess Go Grandmother and the grandfather god, Kim Younggam, is certainly one of Jeju’s majestic shrines. Located is what was Juksung Village before the tragic events of the April 3rd, 1948 uprising, where some 30,000 villagers accused of being communist sympathizers were massacred across the island, the shrine occupies a peaceful, secluded area atop a small rise in the land. Spring water runs directly under the shrine and collects in a number of small pools that were once used by villagers for washing and bathing in times past. Locals, displaced by the events of 1948, but still living nearby, can recall making use of the springs. A thick bamboo forest surrounds the shrine. It’s easy to see why the people of Jeju have long considered Sulsaemit to be a powerful shrine. 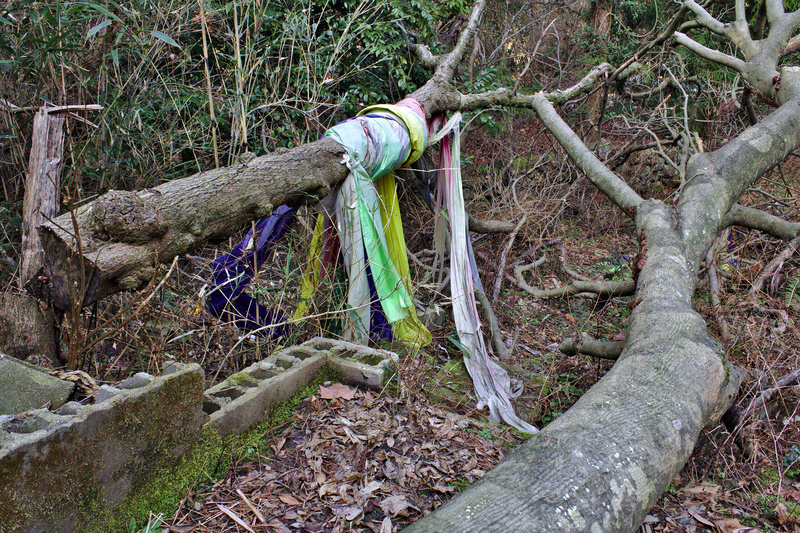 When you pass by the old bathing pools and enter the narrow forest path that leads to the shrine, catching glimpses of prayer cloth and other colorful offerings through low hanging branches and brush , you become full of anticipation– no doubt, there are physiological responses associated with the crossing of certain thresholds, the boundaries of religious places, that occur. 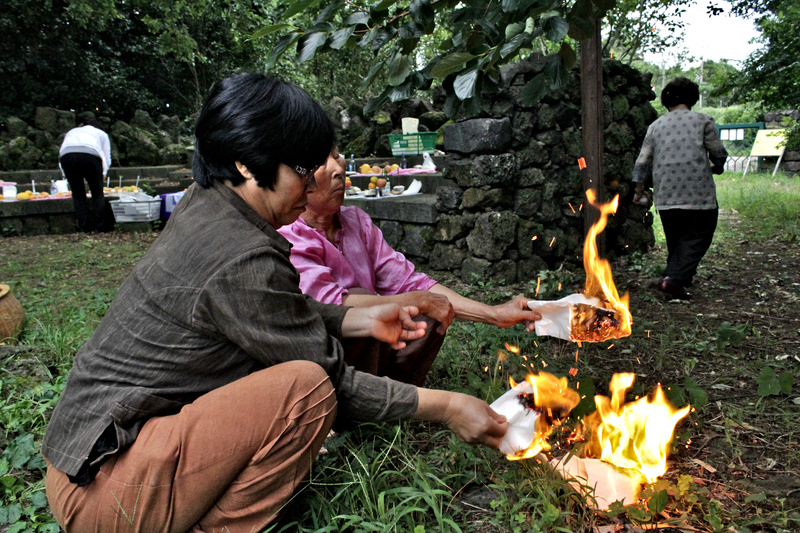 While all of Jeju’s shrines invoke such responses, there is something truly special about Sulsaemit. Crossing its threshold is to temporarily enter a different world, a spiritual world, and this isn’t just flowery language but a phenomenon that has been reported to me by shrine-goers, shamans and secular researchers on many occasions during my three year exploration of Jeju’s shrines. 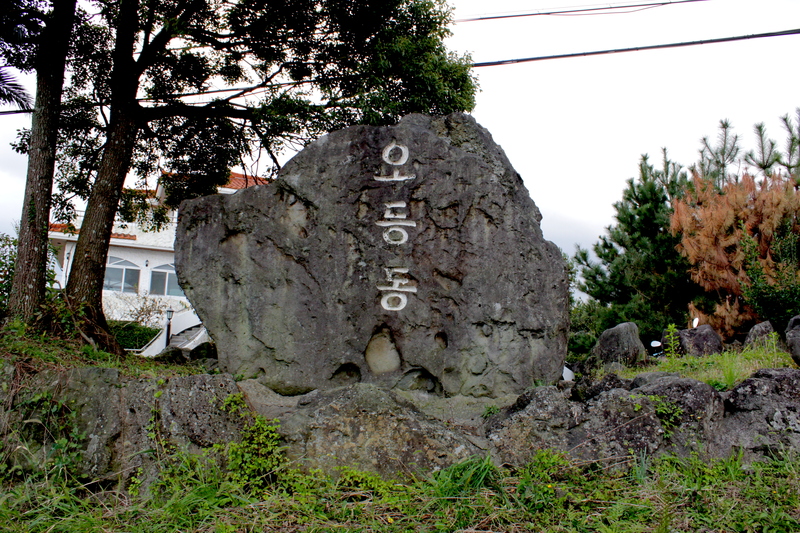 Everyone in the region of Jeju City knows that Sulsaemit Shrine is a ‘senchari‘–‘a strong seat of the gods’. 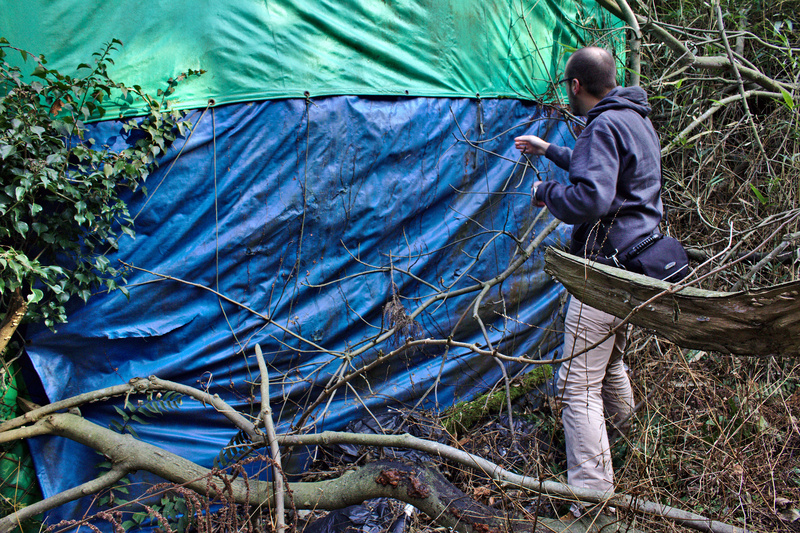 Sometime in December of 2013, some fourteen months prior to the writing of this post, Sulsaemit shrine was systematically destroyed. 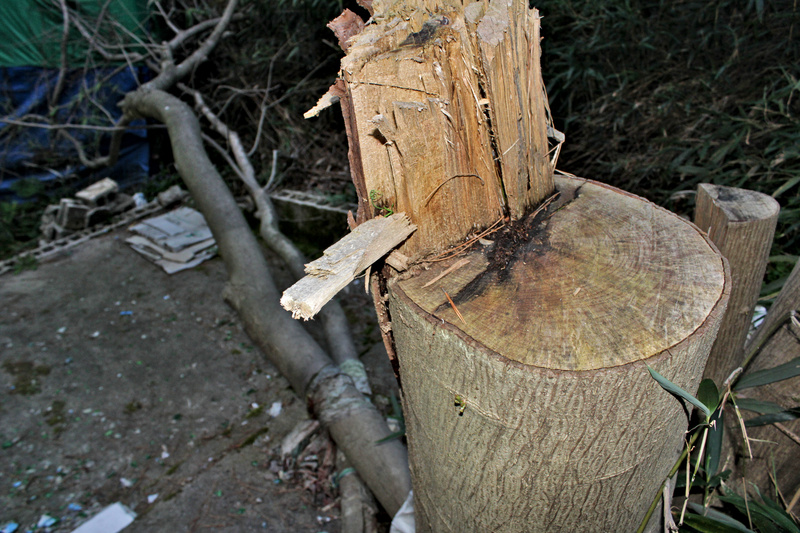 Not only were four of its five hackberry trees cut down with a chainsaw, including the two shinmok (god trees) that stood at the main alter, but the concrete foundation of the shrine was smashed to pieces as well. The assailants made sure to destroy offerings too. Bottles of soju liquor, a common feature in shrines, were deliberately reduced to shards smaller than a fingernail. 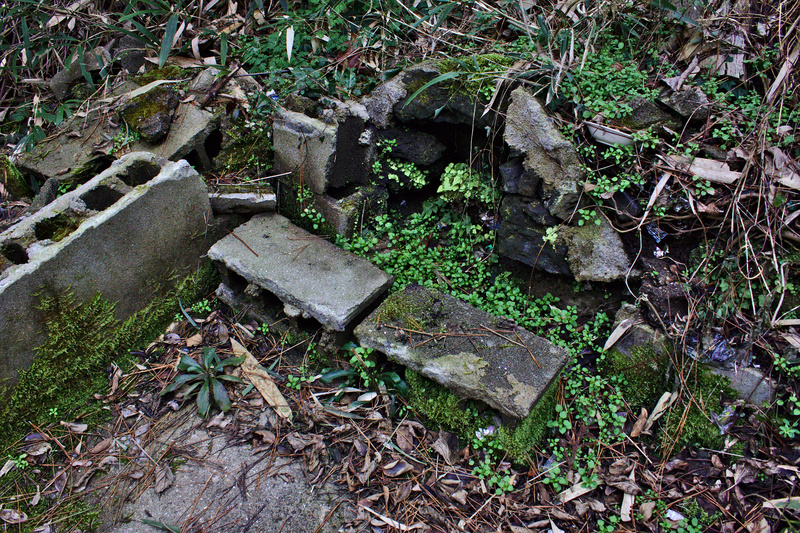 Also, the concrete surrounding the gwenmun or small doors opened at the beginning of shrine rituals in Jeju, were torn away leaving the earth below them exposed. The assault on the shrine was obviously done in a deliberate fashion, so completely, as to leave no question about the severity of the message being sent. But what is message? The motivation? Who is responsible? Odeung Village is surprisingly close to the city, a mere few kilometers from Jeju’s rapidly developing Aradong neighborhood. I say surprisingly because the village itself is still perfectly a farming community where locals cultivate tangerines, buckwheat, pumpkins and onions. 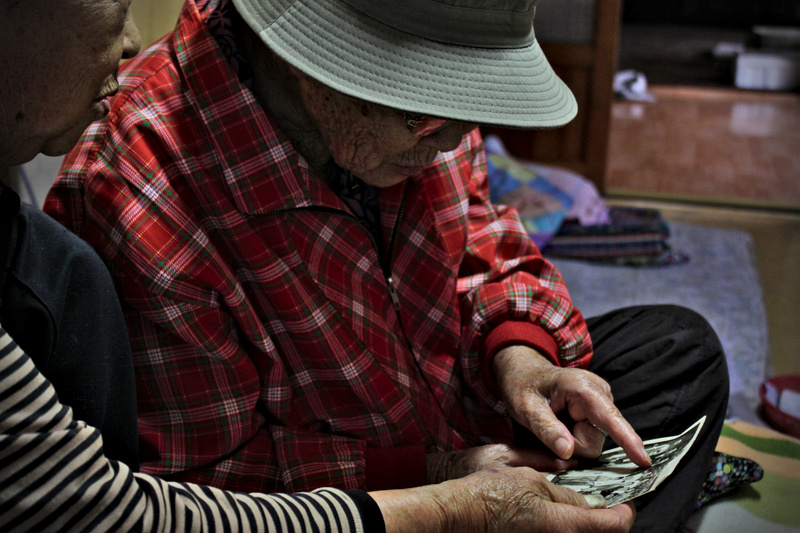 The elderly gather at the senior center for meals, speaking to one another in Jeju-eo, Jeju’s native, endangered language. I quickly learned by inquiring around the area of Sulsaemi shrine that the people who had survived the massacre of 1948 in Juksung and nearby Godasi village, had been relocated to Odeung Village. It seems about half of the residents I spoke with had come from the destroyed villages further up the mountain. The women in the Odeung senior center described to me their childhood experiences of fleeing Juksung and Godasi villages in 1948. 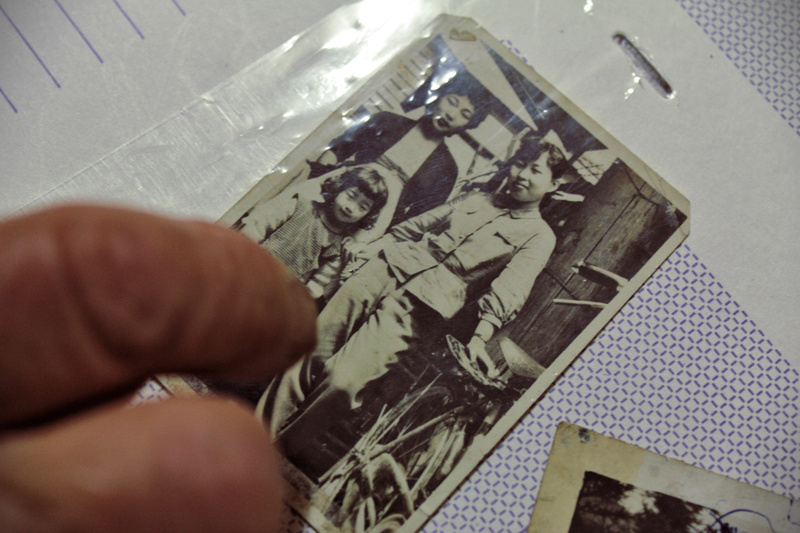 Several seniors shared their memories of seeing men and women executed in cold blood. One woman, who was just a child of perhaps eight or nine at the time commented, “I saw dead wives, grandmothers, babies even.” She added, “They even killed the cows–the police did. I saw dead cows with twisted necks.” It struck me that to a child, this detail had been especially bewildering. The army and police had destroyed all the people in the women’s lives, all their possessions. They had let some of the younger women go. Following the massacre the only one thing that remained in Juksung village, was Sulsaemit shrine. Despite the fact that no one native to the village would return to reside, the original residents still would make the trip up the mountain to worship at their native shrine. When I inquired about who had destroyed the shrine, one resident emphatically said, “People who believe in Jesus did it.” A nearby woman added, “Those people came from outside of Jeju, a person from Jeju wouldn’t have done that. We pray there.” I asked a few other women if they still believed in the local deities, the Door God, the Hearth Goddess, the Mountain God, the Sea God, the tutelary shrine gods–“Are you kidding,” said one of the women in a voice that seemed to dismiss the question as a stupid one, “who doesn’t believe? Sure, we believe.” Initially, I was worried about asking about Sulsaemit shrine’s destruction, worried that there might be someone involved in its destruction present at the senior center, but people spoke openly and even praised me for including the story in my documentary. 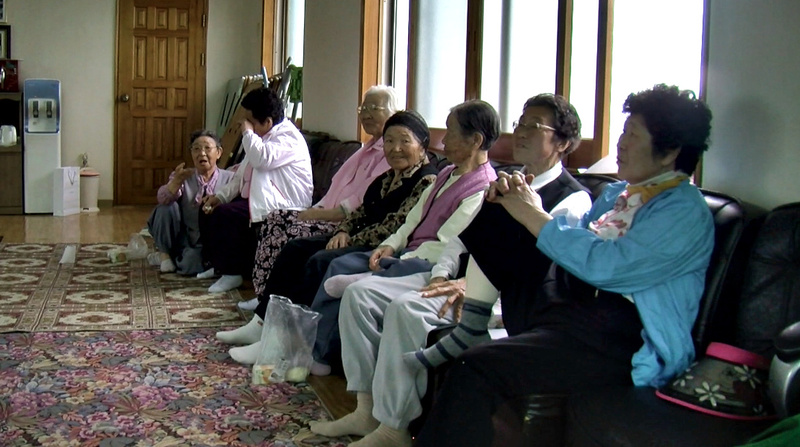 That day at the senior center, I quickly confirmed something I had heard my first morning in Juksung, from people who had come to live in the area after 1948. This wasn’t the first time the shrine had been destroyed. 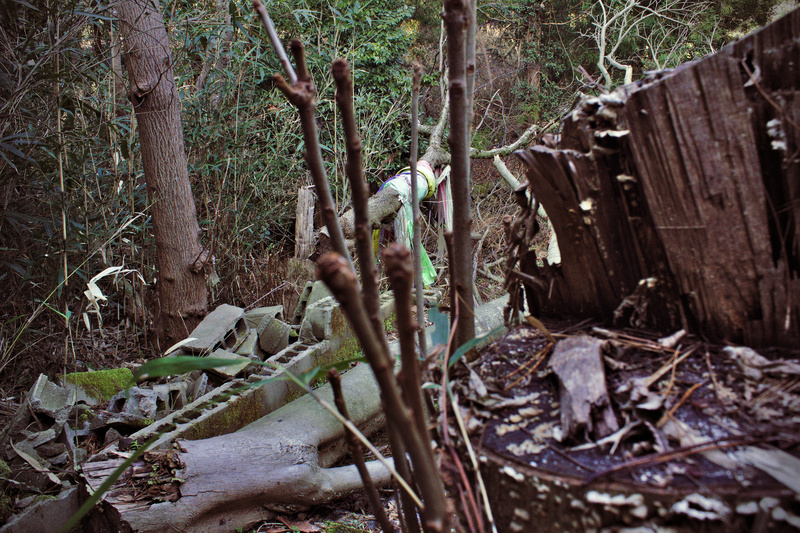 Shortly after the deplorable events of 1948 a protestant preacher who came to live in the area had cut down the original trees in the shrine, trees that had most likely, considering the description of them I was given, been growing for hundreds of years. As determined as the outsider may have been, it hadn’t been so easy to eradicate the native religion. After he cut the trees, the man contracted a terminal disease and died. 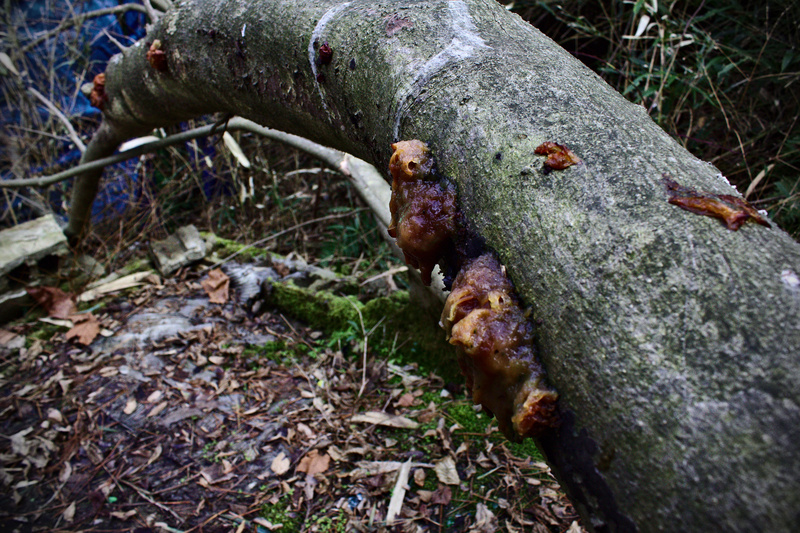 Anecdotes about people who have mysteriously fallen ill after disturbing holy trees in Jeju aren’t all that uncommon. This particular episode has become a piece of lore, that while isn’t part of the official ‘Bonpuli‘ of the shrine, (a Bonpuli is a myth that tells the origin of the gods residing in a shrine) is certainly something people bring up when talking about Sulsaemit. In the early 1950s the villagers planted new trees, the very trees that were recently cut, and continued making the trip to their former village to pray and perform ceremonies, especially in lunar January. 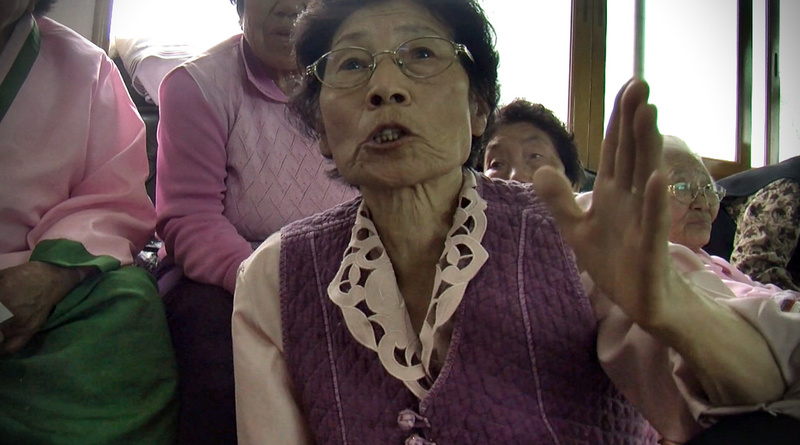 I visited two women from the senior center, sister-in-laws, who fled Juksung in 1948. They shared photo albums and their memories. Despite extreme adversity, the two women overcame, raised large families and were able to live good lives. Now nearly a year has passed since I first went to Juksung to visit Sulsaemit shrine. Recently, I returned with Tanner, a researcher friend who has received a fullbright grant to do research in Jeju. While last year the shrine was nearly clear of decay, this year the fallen trees have been colonized by slime mold and the concrete is being quickly enveloped in moss. 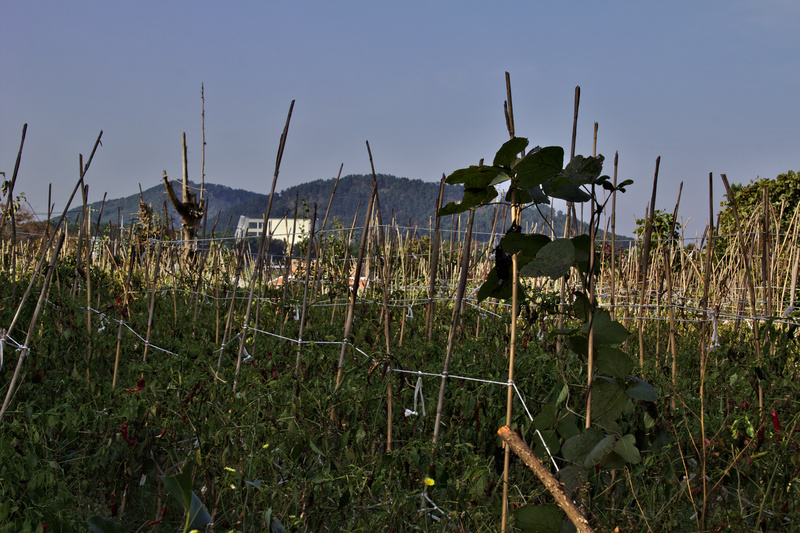 A single season of growth in Jeju is enough to corrode even an inhabited structure, as local residents know well. The main altar of Sulsaemit shrine. 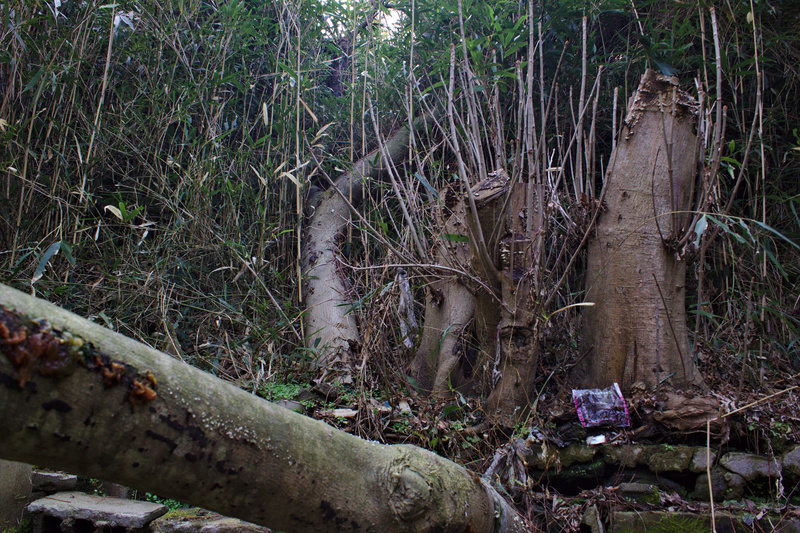 The ‘shinmok’ (holy trees) no longer stand. The shrine was desecrated last winter. Lunar January, the period in which offerings are traditionally made at the shrine is coming up fast. There is a burning question. Who will rebuild the shrine? As before stated, Juksung Village’s Sulsaemit is a well-known shrine, a shrine thought to be a powerful one indeed. It has been a well-kept shrine until last December, kept clean and organized by attendants who visit throughout the year. 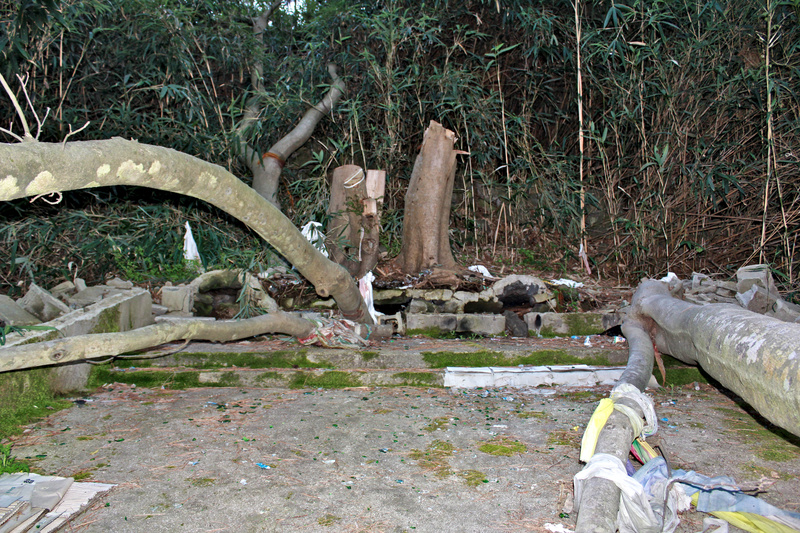 Last winter, when news of the shrine came to light, many Jeju residents complained to the local town government, county government and police, inquiring about making such repairs. Upon making my own inquiry I was told by the county government that the town was responsible and when contacting the town government was told that the county was responsible. The police had opened an investigation but had failed to discover the culprit. I didn’t feel it my place, as an outsider, to be causing trouble by digging too deep into the matter. Also, I feel it is irrelevant. I became more interested in the role that the shrine played in the spiritual lives of these individuals displaced by the 1948 massacre and found it very striking that despite all that had been torn away from them, Sulsaemit shrine had not been taken. The villagers’ faith remains intact. I feel it an abomination that the people of Jeju would let the shrine fall into ruin. There is much historical precedent for shrines being rebuilt after such occurrences in Jeju and that tradition shouldn’t been abandoned now. I have heard that the land on which Sulsaemit stands is now private property, still the fact that this small piece of land isn’t economically viable being situated atop a spring should be taken into consideration. The larger community should create a movement to protect this shrine and others that fall under similar threat. First of all, I don’t believe who committed the act is of much importance in the face of rebuilding the shrine. Whether the act was committed by local protestants as many have suggested or by the hand of some other person for some unknown purpose, rebuilding the shrine will send a clear message to those responsible and to the larger community during these times of rapid development on Jeju Island. I would call upon the various research offices that are involved in the preservation of Jeju’s traditional religion to come together and pool resources either by direct donation or through government funds in order to clear out and rebuild the shrine. Such an initiative should employ volunteer labor to cut costs and reinforce the sense of community. Where to get new trees? That’s an easy one. The land south of Sulsaemit shrine is occupied by a large greenhouse operation which deals in a large variety of saplings. Seeing as they are a part of the community, I’m sure they wouldn’t mind donating several young trees to be planted in place of the felled ones. After spending time with elderly members of the Odeungdong community, it is clear that the original residents of Juksung are simply too aged to carry out this kind of initiative. Shouldn’t all of Jeju’s shrines be preserved for future generations to enjoy, especially shrines with such a magical atmosphere as Sulsaemit? The people who rebuilt the shrine after 1948 went through such hardships and raised children who went on to have better opportunities than they had ever dreamed of having. The successes of the island are built upon their shoulders. Shouldn’t the younger generations give back? Jeju Island’s shrines are some of the oldest existing structures on the island. There is a reason they have survived the ages. They are sacred places. They represent the island’s deepest identity. Furthermore, they are a world treasure. They are all of humanity’s treasure. For this reason, despite the fact that I am an outsider, I don’t feel bashful about making my opinions clear. If you look at Jin Sung Gi’s dictionary of Jeju Island’s shrine myths, and turn to page 344, you will notice a curious passage. The Bonpuli myth of Sulsaemit shrine states: Even Governor Yi, who destroyed 500 of Jeju’s shrines, couldn’t destroy Sulsaemit shrine. It was such a powerful seat of the gods–senchari, that even the notorious General Yi couldn’t bring himself to destroy it. 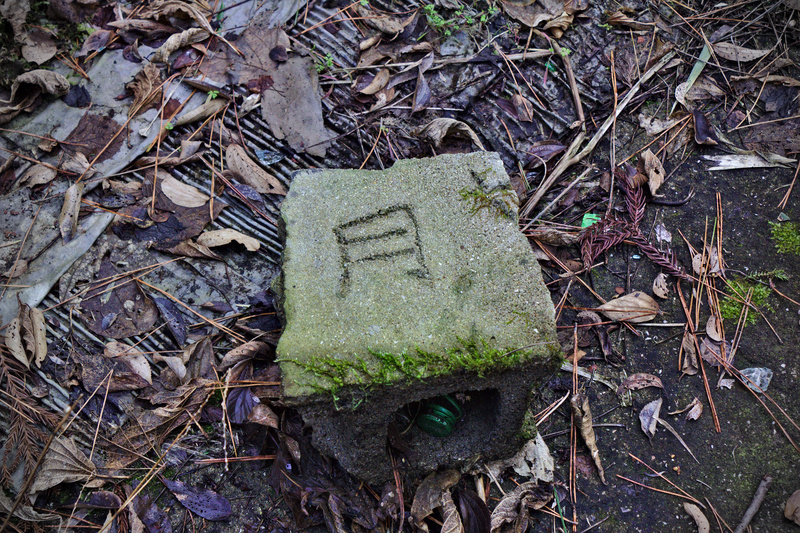 Next Post A Shamanistic Shrine Was Desecrated on Jeju Island, South Korea. TODAY WE ACT.